These 6 3D prints are the end result of a few weeks of work gearing up for Design Philadelphia, where I will be exhibiting this work along with the interactive tools that created it in the Crane Arts Center. If you look back to the first post on this topic you can see the original renders after experimenting in Grasshopper, or check out the video showing how these models can be customised using 2 Wii Nunchuck controllers, as you will be able to do in the exhibition. 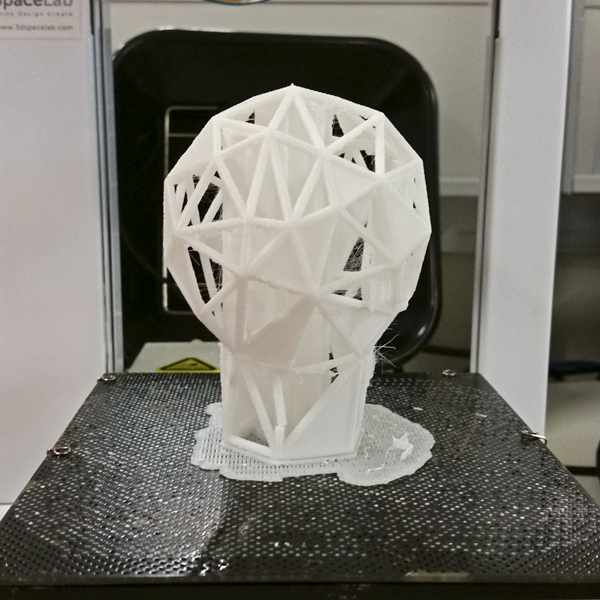 These prints were produced on a Fortus 250mc 3D printer, and took 94 hours! Why so long? 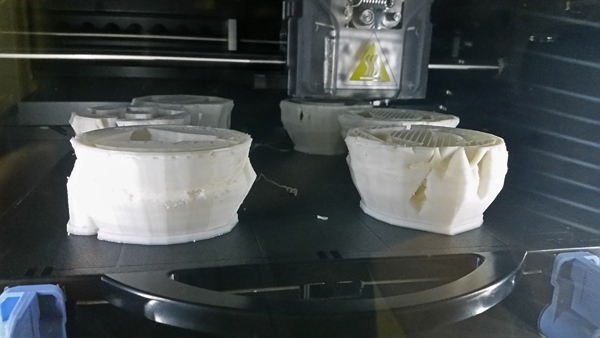 Well the software that drives this printer has limited options, in particular there is no option to modify anything to do with the support material – as a result, it just puts support everywhere! It’s a bit of a waste, but I guess with these commercial printers you trade a lot of flexibility and control for reliability and quality. You can see in this image how the objects are entombed within support, which is removed by dissolving in a special solution. For comparison you can look at the original design of my Shattered Faceted Lightbulb which printed with almost no support material in only 4 hours on my Up! Plus 2. The other thing you’ll notice is that the final prints are red – this was done with a few light coats of spray paint since we only have one colour of filament for the Fortus 250mc, but I was asked for the prints to be done in red by the exhibition curator. Often painting 3D prints seems to highlight any flaws and make the layers seem more obvious, however this time because of the high quality of the printer this hasn’t happened. Phew! I don’t think most people would even know they’ve been painted rather than printed in red plastic. I’ll post some photos of the installation next month when Design Philadelphia kicks off. This is a simple design downloaded from Pinshape of a low-poly fox (or cat), created by @steven_dakh. He has a whole range of different animals created in this low-poly style, and I needed something to run on a printer during one of my 3D printing workshops to both show how the printers work, and also talk a bit about resolution and STL’s. Also it’s always nice to print something new rather than my own designs, and introduce some new people to the world of 3D printing and 3D printing communities like Pinshape! This model printed in 1:47 on an Up! Plus 2 printer using the 0.2mm layer thickness, and required no support material which is always great. I also scaled it down from the original which is quite big. There’s not much more that I can say on this one, just a simple print that can now be given as a gift to someone who loves cats (yes this relates back to a previous 3D printed cat I made!). Note: like me, @steven_dakh is also on Thingiverse and you can download the design here if Thingiverse is your community of choice. The model was printed on an Up! Plus 2 3D printer, using the 0.2mm layer thickness and minimal support material. As you can see in the image to the left, there really was only a small amount of support material generated in the middle to support the top section, and this broke away very easily. You can also see a small break near the bottom where the printer must’ve bumped the model as it was printing, but thankfully it kept printing. Overall it took about 4 hours to print. If you’re planning on making one, the minimum diameter inside the design to fit over your light fixture and light-bulb is 31mm – if you need it larger, just scale up the design before printing. Use Revolve to create the light-bulb form. Convert this to a Mesh. Reduce Mesh to create the faceted effect. Use the Line tool to connect the points of the faceted mesh. Use the Pipe tool to add thickness to the lines. Add some solid sections to fill in some of the gaps, then Join all the pieces into a single mesh ready to export to STL. If you make one please share your photos back on Pinshape or Thingiverse so I can check it out! As I sit here in a food-coma following Xmas, the most I can manage is a bit of CAD experimentation since I don’t need to move! Continuing on from a previous post about using MeshLab (free software to manipulate STL files), I’m creating some basic forms in Solidworks (where I can perfectly control dimensions), exporting them as STL files, then turning them into faceted/low-poly 3D models within MeshLab. While this won’t give perfect geometric control of the final shape, it can give a very quick faceted form relatively close to the original dimensions. Within MeshLab the above example is using the ‘Clustering Decimation’ tool (from the top menu go to Filters>Remeshing, Simplification and Reconstruction>Clustering Decimation). Within this setting, the ‘World Unit’ used for the image above was 15, resulting in 48 faces. I’ve also had some success using this particular tool to reduce the overall STL file size of some complex forms, just takes some experimentation. However if you want to really control your faceted 3D model within Solidworks, check out an earlier tutorial I’ve written by clicking here. Another design and another excuse to share some of my modelling process using Solidworks. This can be applied to far more complex forms to achieve that faceted or ‘low-poly‘ effect with as much dimensional control as you like. Of course there are a million ways to skin a cat (or model a Solidworks part) and this is just the best process I could think of for accuracy on this particular design I’m working on. Feel free to leave a comment about your own methods or tips, I’m no expert! Step 1 Give yourself some orthogonal views of the overall shape you want to achieve. This includes the triangles that will be used for the facets. For this one I just used a front and top view. Step 2 Create a 3D sketch and connect all your vertices. Of course you can move things around if you like, but connecting back to those first sketches you set up really helps control the 3D sketch, which are notorious for having a mind of their own. Step 3 Create another new 3D sketch, and convert just 3 lines from the previous 3D sketch that forms a triangle. Exit the sketch and use the Filled Surface tool to create a flat 2D surface. Step 4 Repeat until you have enough flat surfaces to define your shape. Always be on the lookout for a pattern in your design – any opportunity to use the Linear Pattern or Mirror tools will really save time, so in this example I’ve only had to model 3 surfaces which I can later reflect to generate the larger design. Then Knit the surfaces together. The coming steps are where there are a number of ways to proceed, including use of the Offset Surfaces tool or Thicken. However these always result in messy, uncontrolled edges, so I’m not a fan. Instead I have setup another 3D sketch, and drawn some lines back in the z-axis from the vertices of the knitted surface – this will determine the thickness of the part. Step 5 Repeat steps 3 and 4 to create another surface that sits perfectly behind (or in front of) the first. Step 6 On the front plane (or whichever plane is the primary view) convert the lines of the outside perimeter of the surfaces you’ve created. These can then be extruded into a large block – just make sure you continue beyond the surfaces you’ve created. Step 7 Use the Surface Cut tool for both knitted surfaces, making sure you cut away the block in the right direction. You want to be left with a solid only between the 2 surfaces. In the feature tree you can then right-click on the knitted surfaces and hide them, leaving only the solid material on screen. Step 8 The hard work’s over, now use the Mirror or Linear Pattern tools to expand your design. You can also add any other details (in this case some cut-outs) before using these pattern features. As I said there are many ways to achieve this aesthetic, and many other programs that you can achieve faceted objects far quicker. But if like me you’re wanting specific control of the facets and dimensions (rather than simply taking a shape and reducing the poly count), this might be useful. Please leave a comment with any questions, or like the post so I know it’s been useful for you. Happy cadding (if that’s a word)!